I'm just a newlywed southern gal' with a passion for cooking and baking from scratch, the ol' fashioned way! Got a retro recipe or a vintage thought to share? Email Ellie by clicking here. As much as I love gingerbread cookies, I have to admit that I like actual gingerbread even more. I used to use a wonderful old recipe from Nathalie Dupree to make pans of gingerbread in the fall. Based on that recipe, I developed a perfect muffin that features all the richness and flavor of a classic old-fashioned gingerbread. Preheat your oven to 350 degrees. Line or grease well a muffin tin, and set aside. 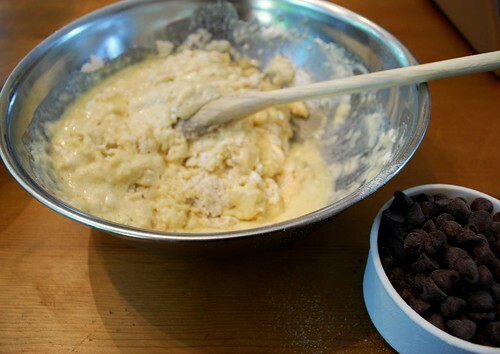 In a large bowl of an electric mixer, beat the sugar and butter until light and fluffy. Add the egg and the molasses and mix well. In a separate bowl, sift together the dry ingredients. In another bowl, mix together the buttermilk, the coke or juice, and the brandy or vanilla flavoring. Add these two mixtures to the molasses mixture alternately, beginning and ending with the dry mixture. Beat until the batter is smooth. Fill each muffin cup about 3/4 of the way full. Bake for approximately 18-20 minutes, or until the muffins spring back when lightly touched with a finger. 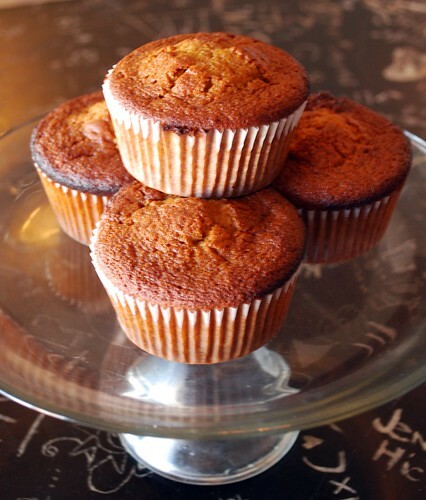 Yield about 18 muffins. To turn this muffin into a lucious dessert, top with creamy Peach Sauce . . . In a heavy saucepan, combine the egg yolks and sugar. In a separate, smaller saucepan, heat the peach juice/brandy/schnapps. (You can also do this in the microwave if you prefer). Pour the hot peach juice gradually into the egg-yolk mixture, whisking constantly. Turn on low heat, and continue whisking until mixture thickens. This could take up to 15 minutes (trust me, it's worth it). Remove from ehat and cool for about 10 minutes, then fold in the whipped cream and vanilla. You may wish to make this ahead of time - if so, chill the sauce until you are ready to serve. 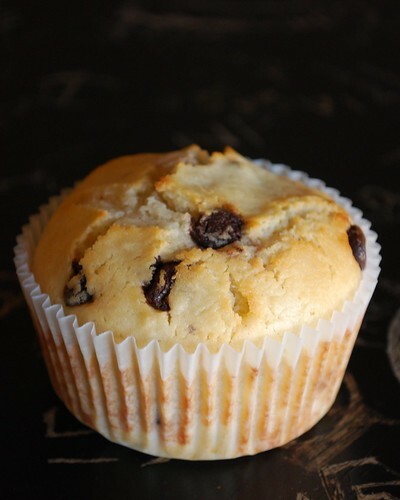 This is a deliciously tender and flavorful muffin studded with rich chocolate chips. I made up this recipe for the little cafe. It is already a favorite with my dad, who makes sure to pick up extras every time he comes by! Preheat your oven to 425 degrees. Grease muffin pans or line with paper liners, and set aside. Combine the dry ingredients well, and set aside. In a smaller bowl, combine the egg, buttermilk, and oil, mixing well. Use a spoon to make a well in the center of the dry ingredients. Then pour the liquid ingredients into the well. Use the spoon to stir together JUST until the dry ingredients are almost moistened. Gently fold in the whipped cream. 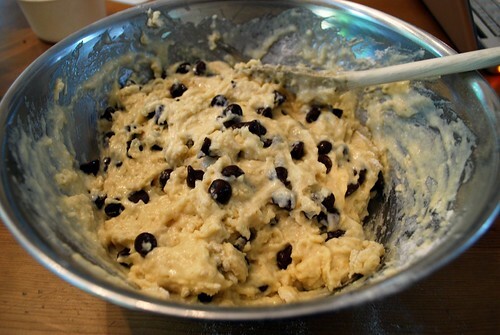 Finally, fold in the chocolate chips, being careful not to over-mix. Fill the muffin cups about 2/3 of the way full. 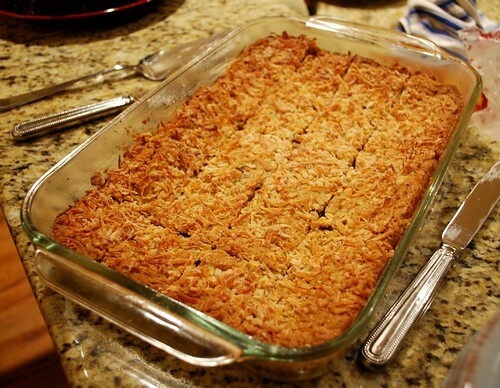 Bake for 18-20 minutes, until the tops are lightly golden brown. Remove to racks and cool. Okay, dear readers, I'm coming out of the closet, so to speak. My posting may have become a bit less frequent these past few months. That's because I've started an exciting new project. My friends here in town own a small coffee shop, and they have let me come in and do some of the baking for them - homemade breads, delicious muffins, and fresh pastries and desserts. It's been so much fun! 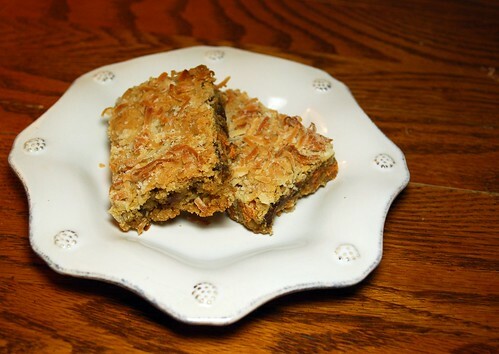 Here is one of the recipes that I tried out at our little café this week. 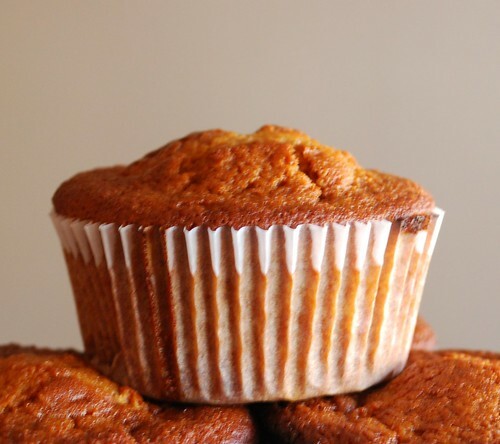 They are pretty much the ultimate fall muffin!! First, prepare the filling. Combine the cream cheese, marscapone cheese, and powdered sugar in the bowl of an electric mixer until smooth and fluffy. Form into a log on plastic wrap or foil, making sure that the diameter is small enough to fit into the well of a muffin pan. Wrap the log up tightly and freeze for at least one hour. Preheat the oven to 350°. Line muffin pans with paper liners for 24 muffins. 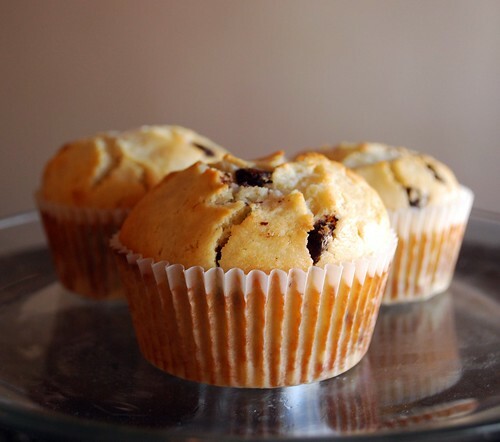 To make the muffin batter, combine the flour, spices, salt and baking soda in a medium bowl. Whisk together and set aside. In the bowl of your electric mixer, combine the eggs, the oil, the sugar and the pumpkin. Beat until well combined. Add the dry ingredients and mix on low speed until just the flour is moistened. To make the streusel topping, combine all ingredients in a small bowl. 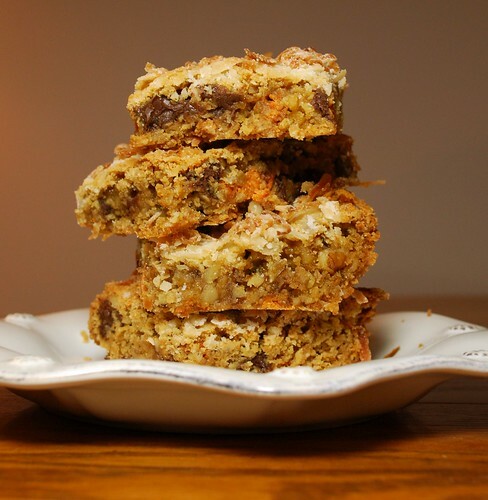 Mix together with a pastry blender or your fingers until crumbly. Next, fill each muffin cup halfway with batter. Remove the cheesecake log from the freezer and slice into 24 pieces. Place a slice in each muffin well. 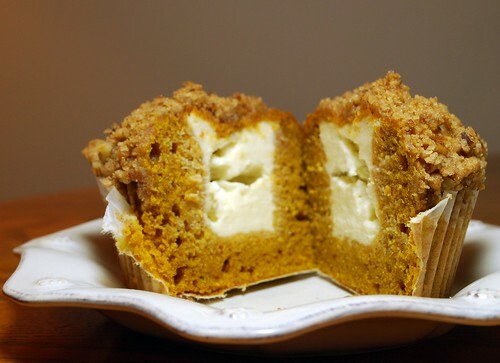 Divide the remaining muffin batter evenly among the muffin cups, covering up the cheesecake pieces. 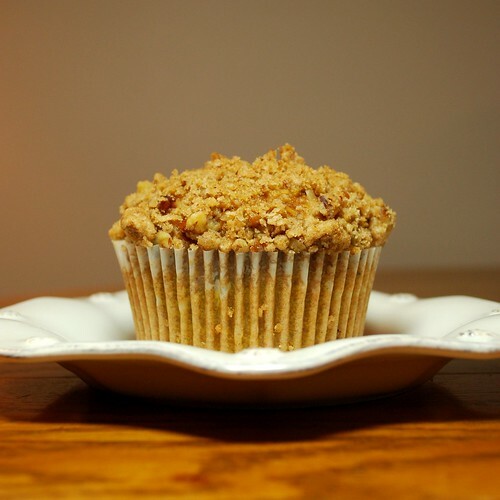 Sprinkle the streusel topping over the top of each muffin. Bake for 20-25 minutes. Cool completely on racks before serving. My sweet friend recently lent me her family's old cookbooks to peruse. I love the cookbooks, but my favorite thing is seeing which little slips of paper and newspaper clippings people stuff inside these old cookbooks. These are some of the greatest recipes in my family's cookbooks, so I made sure to copy down some of my friend's too! Here is a great one I found - enjoy! Preheat your oven to 350 degrees, and grease a 9x13 inch baking dish. Set aside. 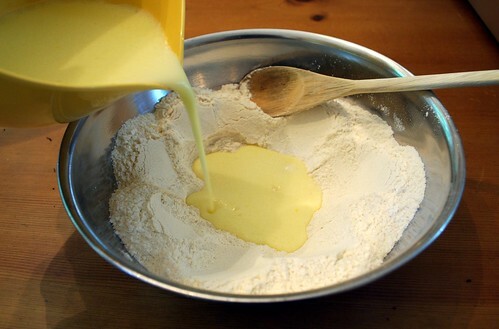 In a large electric mixer bowl, combine the brown sugar and the butter, beating until fluffy. Add the eggs and the vanilla, and cream the mixture together. Add the oats, flour, salt, soda, wallnuts, and both flavors of chips, and stir to combine. Spread the batter in your prepared pan, using a spatula to even it off. Sprinkle the coconut flake on top of the batter. Bake for about 20 minutes, or until lightly golden brown. Cool completely before slicing into bars. I'm not a huge fan of eggplant. I'm not even a medium-sized fan of eggplant. Maybe a small one. Maybe. Sure I like it fried in a crispy curry batter, but in general, nope it's just not my favorite. Guess what filled our last CSA basket of the growing-season to the brim? Bunches and bunches of eggplant! So I'm really branching out here and trying to find some good recipes for all of this fresh eggplant. I remembered this one from our CSA Farm Cookbook, and it was just as good as my memories. The prosciutto adds the perfect hint of meaty flavor to this hearty dish. Even I am wild for this stuff - I hope you enjoy it, too! In one shallow dish, place 1 cup of flour. Next, place two of the eggs in a second shallow dish, and lightly beat. 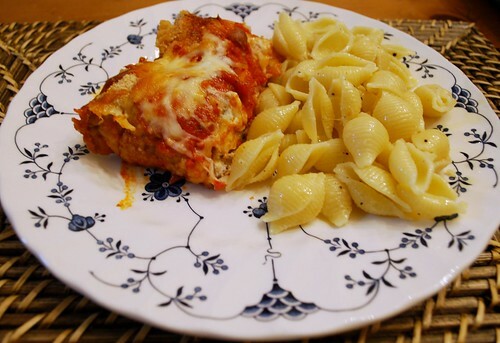 In a third shallow dish, place salt, and half the pepper, and the parmesan in a bowl with 1/2 cup of the flour and and mix with a fork or a whisk until blended. 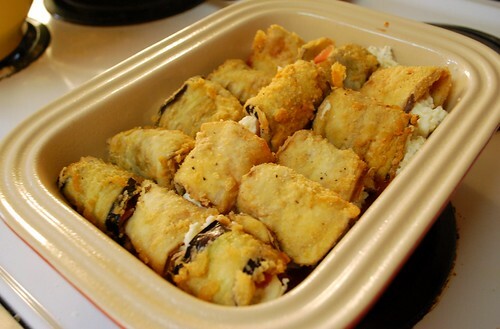 Dip the eggplant slices in the flour, then into the eggs, then into the flour-and-cheese mixture. Meanwhile, heat oil in a large, deep skillet until hot but not smoking. Place the prepared eggplant slices in the hot oil and fry for 2 minutes on each side until golden. Remove from the skillet and place on paper-towel lined baking sheets to drain until cool enough to handle. Preheat the oven to 350 degrees. Place the drained ricotta in a bowl and mash it with a fork. Add the last egg, the parsley, half of the shredded mozzarella, the remaining half of the pepper, and mix well. Set aside. 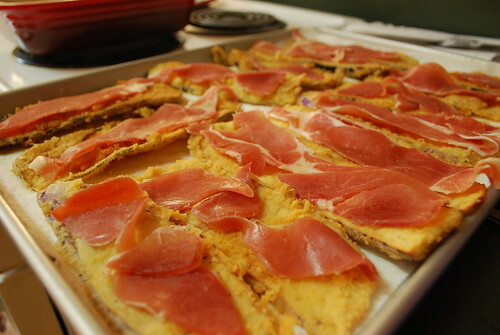 To stuff the eggplant, place one slice of prosciutto on top of the eggplant. 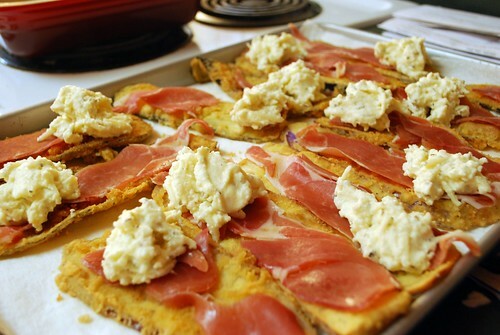 Next, drop a heaping tablespoon of the ricotta mixture on top of the prosciutto at the wider end of the eggplant slice. Beginning with the wider end of the eggplant, roll up, from top to bottom. Pour 1 cup of the marinara sauce into an 8x12" baking dish. 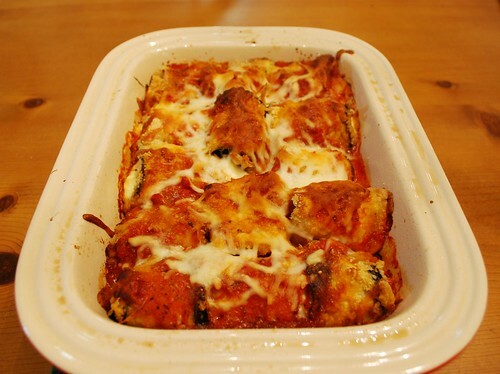 Place the eggplant rolls side by side on top of the marinara sauce. Pour the remaining sauce over the eggplant rolls. 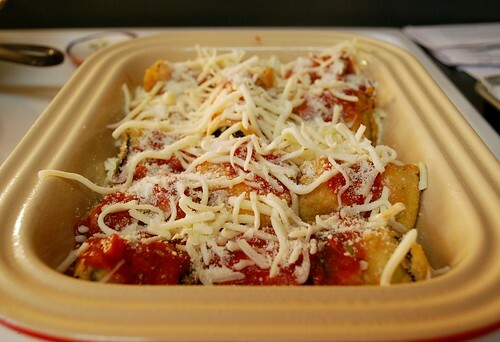 Sprinkle with the 3 tablespoons of grated parmesan cheese and the remaining 1/2 cup of shredded mozzarella. Bake for 25 minutes or until bubbly around the edges. Remove from the oven and let cool for 2-3 minutes before serving. Note: To drain ricotta cheese, peace it in a sieve or cheese cloth and set over a bowl. Cover with plastic wrap and refrigerate for at least 6 hours, or overnight. Discard the whey and use the cheese as directed in the recipe! For a vegetarian option: simply omit the prosciutto! vin⋅tage [vin-tij] - adjective - representing the high quality of a past times. vict⋅uals [vit-lz] - noun, plural - Food for human beings, esp. when it is cooked or prepared for the table; that which supports human life; provisions; sustenance; meat; viands. when ellie isn't baking, she's reading these ladies' blogs! Click on the onion to see all the recipes and find out more about the first annual Vidalia Victuals Contest! And check out our winner: Caramelized Vidalia Onion and Goat Cheese Grits, from Courtney of Cooks Like a Champion! Got a great Vidalia Onion recipe? Enter it in the Sweet Memories Contest to win cash prizes from the Vidalia Onion Committee! Please note that the original photos and posts on this blog are subject to the protection of all applicable copyright laws. I love to see other bloggers using my recipes and linking back to me! Sharing my family's recipes with my readers is the most rewarding part of my blogging experience. But I do ask that you please email me for permission before using any of my original photos or writing. Thanks for visiting! Y'all come back!